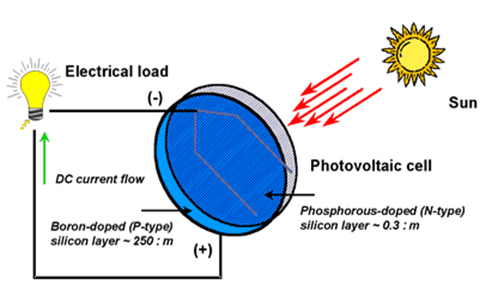 Light can be converted to electricity using the Photo-Voltaic (PV) Cell. If the source of that light is the Sun then the cell is called a Solar Cell. Silica (SiO2) is the compound used to make the solar cells. It is first refined and purified, then melted down and re-solidified so that it can be arranged in perfect wafers for electric conduction. These wafers are very thin. The wafers then have either Phosphorous or Boron added to make each wafer either a negative type layer or a positive type layer respectively. Used together these two types treated of crystalline silicon form the p-n junction which is the heart of the solar– electrical reaction. In the p-n junction the n-type wafer treated with phosphorus has extra electrons which flow into the holes in the p-type layer that has been treated with boron. Connected by an external circuit electrons flow from the n-side to create electricity and end up in the p-side. A solar cell is the basic building block of a PV system. A typical cell produces .5 to 1V of electricity. Solar cells are combined together to become modules or if large enough, known as an array. Wind is created when the sun unevenly heats the earth's surface. Air above a hot surface rises up. Thus, air from a cooler surface flows in. Occupies least land area per kw of energy generated. Compatible with grazing and crops. The blades of a wind turbine convert the energy in wind to rotational movement of a shaft which is connected to an alternator. The electricity thus produced passes through wires to a charge controller and a battery bank. The battery bank stores the electricity which can be used when required. Wind turbine has a yaw movement which helps it attain a position to capture maximum energy from the wind. In large turbines this movement is controlled by advanced computers. In small turbines this is done by a tail-vane. Wind turbine rating is not regulated hence each turbine manufacturer rates his turbine at a different speed. The power curve (power output at different speeds) of a wind turbine is a better measure of its performance. The ideal method is to calculate the output at a particular speed. Considering that the wind speed changes by the day, by the hour and by the minute not mentioning the monthly or seasonal variations, this is a complicated task. Copyright @ 2010 All Rights Reserved.